Nefesh B’Nefesh awards immigrants from English-speaking countries for making a 'major impact' on the Jewish State. 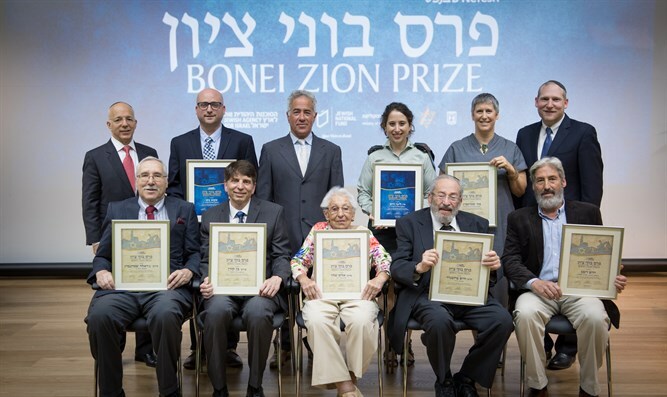 Nefesh B’Nefesh honored the nine recipients of the 2017 Sylvan Adams Nefesh B’Nefesh Bonei Zion Prize today, Monday, June 26th at a special ceremony at the Knesset in the presence of Minister of Regional Cooperation, Tzachi Hanegbi, Minister of Aliyah and Integration, Sofa Landver and additional dignitaries. The award recognizes Olim (immigrants) from English-speaking countries who have made a major impact on the State of Israel. Minister Hanegbi said that he was deeply inspired by the English-speaking olim, as well as their commitment to strengthening the State of Israel and world Jewry as Olim to Israel. "Being the husband of an Olah Chadasha (new immigrant) who made Aliyah at 19 years old, I know how challenging but how exciting it is to be an Oleh and to get adjusted to Israeli society and contribute to this great country," said Hanegbi. "We see the headlines in the media and in the newspapers...about terrorism that never stops really. But all these issues are not as important as this event and Aliyah as a whole. The fact that Israel is still attracting people from all over the world to come - people with optimism, vision and hope - this is the answer. This is the most effective answer to our enemies and those who wish our demise. Thank you to Nefesh B'Nefesh and these prize recipients, you should all be proud of everything that you have achieved."